A few weeks ago, I had a lovely parcel arrive; a load of Choice Discount goodies! They had been in contact with me to see if I would like to receive some bits to try out and share with my readers – who am I to refuse such a request? I don’t visit Choice Discount stores as much as I would like, as they aren’t terribly local to me, but their website will be launching soon, and that means shopping all those lovely bargains from the comfort of my own home! Sadly the photos I took didn’t turn out too well – I had planned proper full length outfit photos, but tripod issues stymied me, and then most of the photos I took were out of focus! But there were a couple that were OK, and I picked the best one of them to show you the top that I got sent. Sophie, the lady I was working with, said that she had seen from my blog that I liked prints, so she picked out this top for me. It’s always nice when people actually take the time to read your blog and get to know you a bit! I do really like the top; I especially like how it is a big longer at the back, though I did find I had to wear a vest underneath it, just to make sure there were no embarrassing muffin top issues! 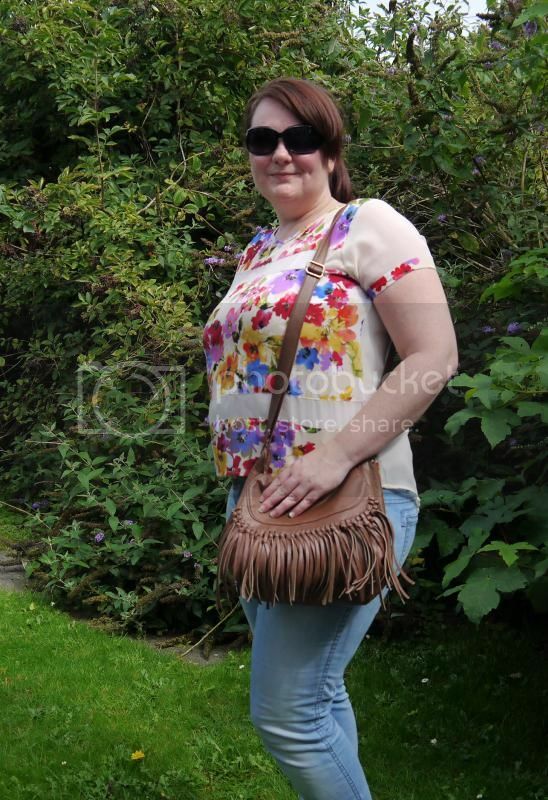 I also received the sunglasses and the bag from Choice Discount – you can never have two many pairs of sunglasses, so I was really pleased to get them! And the bag has become the one I grab every day; it’s the perfect size, because it doesn’t look huge, but it’s massive inside. Seriously, I’m always losing my phone in there. I wasn’t sure about the fringe at first, but now I love it. 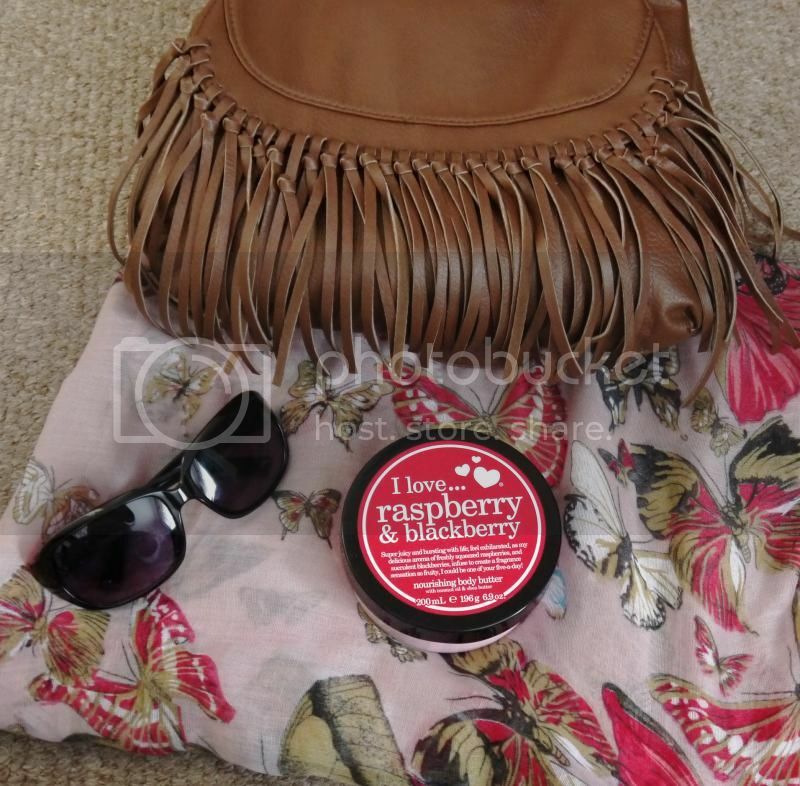 Choice Discount also sent me a lovely purple butterfly scarf, and some raspberry and blackberry body butter. The body butter smells utterly divine, and I almost lost the scarf to my seven-year old niece the other day, as she was prancing round the house in it for ages! I loved my little package from Choice Discount, and like I said, they will be launching their website soon, so even if you don’t live in Essex, you can still partake in their lovely bargains! * I received these items free of charge from Choice Discount, but as ever, all reviews and posts on Is That You Darling represent my true opinions.